Gone are the days of just a product and a price tag. As Visual Inspirations is about to reveal, today’s shopping centre installations and retail Christmas displays are all about the wow factor. To prove our point, here are our top 15 favourite unique displays and retail layouts from around the world (in no particular order) with that ‘boom boom, shake the room’ result that Visual Inspirations is famous for. 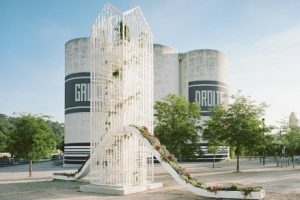 Flower Pavilion by Laisné Roussel, designed for the inaugural 2017 Lyon Architecture Biennale. 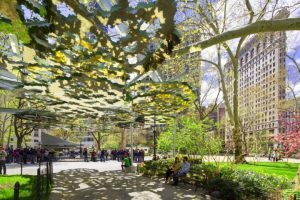 We applaud this inhabitable installation’s light, airy structure, calming greenhouse vegetation and a meditation space at the climb’s end. 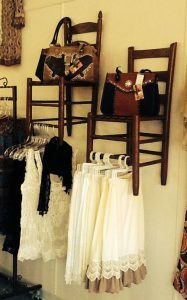 A simple idea, done very effectively by Trendy Lime Boutique. The simple use of chairs to break up space also highlights products in a fun way. Tokujin Yoshioka’s White Forest perfectly expresses the lightness of Hills Avenue shoes. It translates an emotional result to the shopper well before they’ve tried anything on. Selfridges of London is famous for its window displays. 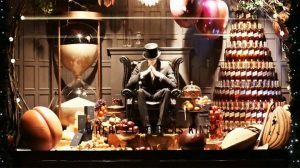 We loved that the creators of the Johnny Walker ‘Where Flavour is King’ window (LOVE creative agency) took the iconic Striding Man, sat him in a contemplative pose and let the picture sell the story. 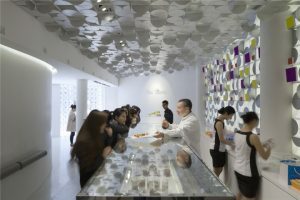 Grains of Purity is a mesmeric installation by we+. 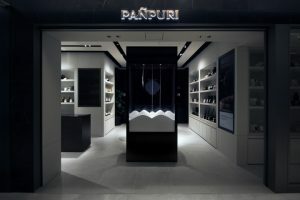 Created to promote Tokyo department store PANPURI, seven nozzles dropped fine white powder into gentle shapes to promote purity and nature. This is a perfect example of brilliant architecture serving the future of humans. 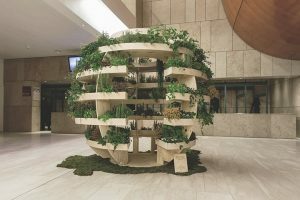 The Growroom by Ikea, designed by Space 10, was exhibited as part of the 2017 Sustania Living Conference in Copenhagen. The design takes sustainable farming up instead of out. 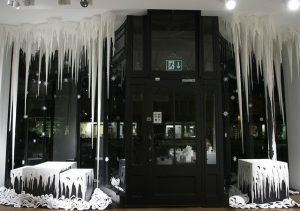 Selfridges breathing window by Studio Soufflé. 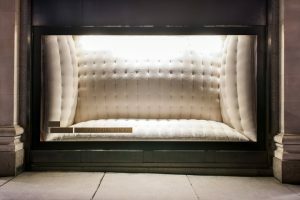 This padded cell design was commissioned for Selfridges. Various inflation and deflation fans gave the appearance of the walls breathing, successfully motivating passing customers to ‘take a breath’ in their busy day. Another simple yet effective display idea. Cowichan Embroidery devised this clever product display shelving to help customers inspect their t-shirts without disrupting everything. Clever! Customers want to know: Do you have what I want? Can you cover me in creativity or excitement? 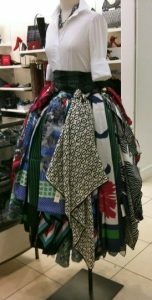 This Pinterest picture does it all via a simple assortment of scarves. Andy Singleton: Paper Ice Caverns is a refreshing take on Christmas. The caverns were constructed entirely from paper including 3D icicle sculptures. Bravo! 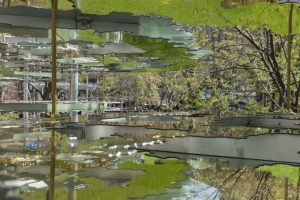 A fata morgana managed to immerse passers-by in an optical illusion of golden, shimmering light, turning the familiar landscape into a new sensory experience. Aimé Patisserie was a new brand in a busy area. 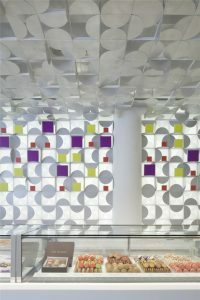 The brief to LUKSTUDIO was to help it stand out from the surrounding chaos. We give it a big tick. 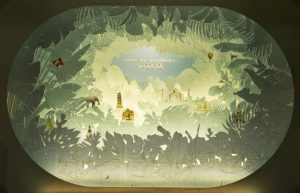 Titled Bestours summer window display, this extraordinarily intricate window design by Mateo Fumero highlights luxurious Oriental destinations via an intricate multi-layered 3D perspective that is 2 metres deep. 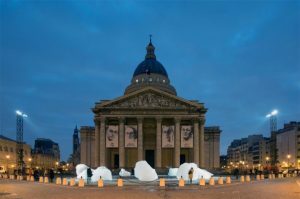 Ice Watch Paris made a striking visual impact about climate change. 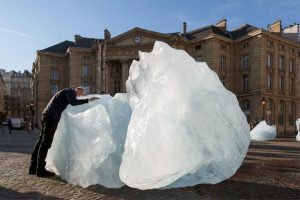 Artist Olafur Eliasson brought 12 immense blocks of ice from a Fjord in Greenland and assembled them in Paris in a clock formation… where they slowly melted away. 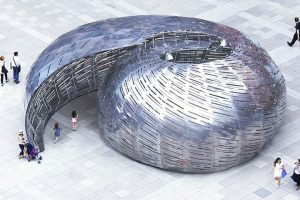 Orbit Pavilion by Studio KCA created an unforgettable sound installation. Visitors would walk into the shell and listen to the orbits and sounds of NASA satellites in real time. 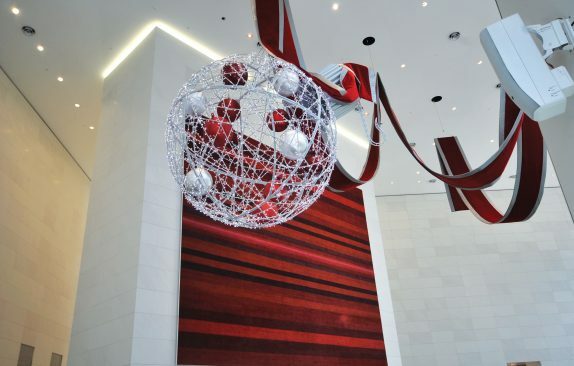 Need a world-class installation with visual impact? We at Visual Inspirations believe in grasping a consumer’s attention by transforming a space for impact, resulting in a desire to act or buy. We don’t come to you with a ready-made image in mind. We custom make every one of our installations for maximum customer impact whether it’s for shopping centre or retail Christmas displays. In fact, we’re working on some new client ideas right now. We’re ready to meet your business’s needs the moment you make contact on 9371 8618.